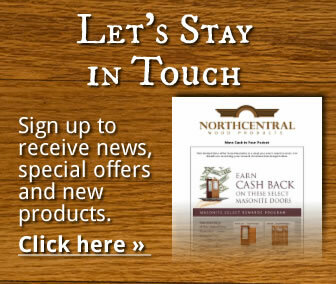 Click here to download the PDF version of this newsletter. On January 29th, 2014 at 12:47 a.m. I received what was about to be one the of the worse phone calls I had ever received. I was informed that there was a fire in our facility and that smoke was coming out pretty heavily. In a daze I threw on some clothes and rushed to the shop. As I turned up the driveway I could see that our local fire department had just recently arrived at the scene. At this point there was quite a bit of smoke coming from the north end of our facility. I remember thinking that this is not the greatest thing in the world but glad the fire department was there. I began to try and forecast the extent of the damage and come up with a game plan on how we were going to move forward. 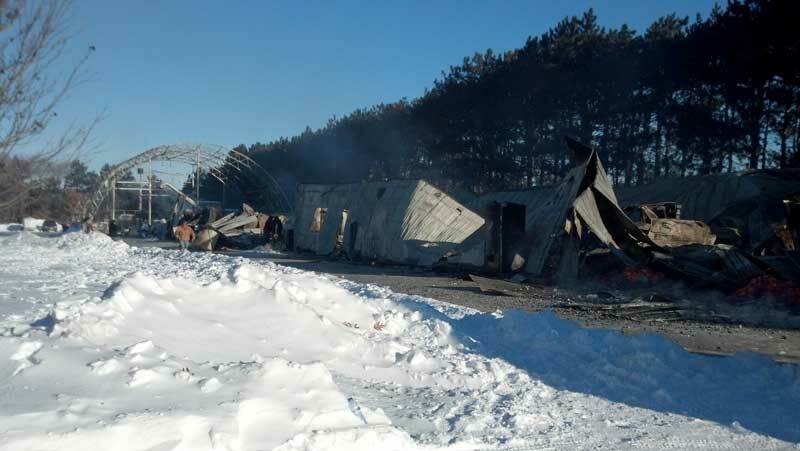 The fire crew worked on getting set up in the nearly -30 degree temperature struggling with frozen hose connections. It was now approximately 1:30 a.m. as we noticed flames starting to come from the roof and firemen were just getting water to the fire. As I watched them work the fire I realized there was going to be a little more damage than I originally thought but at least the fire was under control, or so I thought. Shortly later I heard the men yelling for more water but the tanker was out. The flames started grow-ing again and now had spread further north into our attached tent building were we kept inventory and also began sneaking south in the attic. Mutual aid was starting to arrive and water had now be-gan to flow steadily. There were a few fire walls that slowed the spreading throughout the night and gave me a glimpse of hope that they would have been able to take control once again. Hopelessly, the fire crawled across the roof line beneath the metal roof only showing itself once the ceiling inside collapsed pulling the roof in with it. 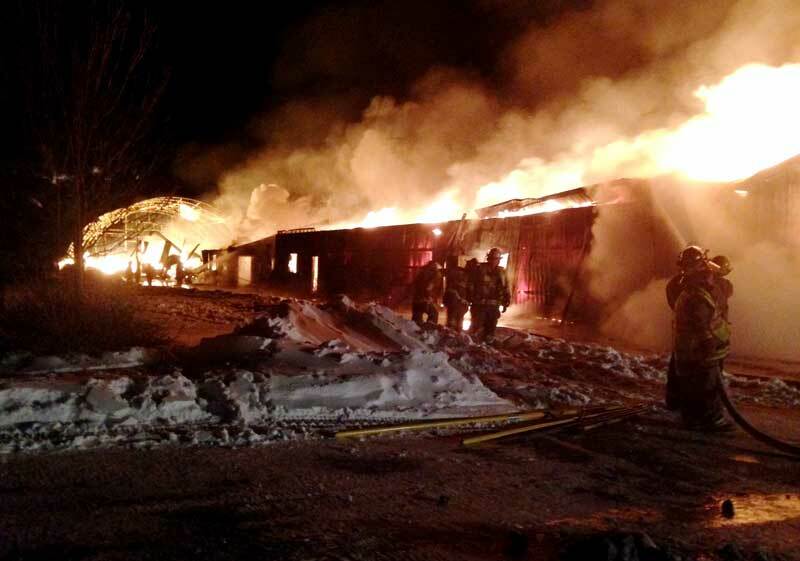 Now with nearly 80% of our 15,000 square foot facility engulfed the focus switched to possibly cutting the fire off before reaching the furthest southern part of our building where sat some nearly 50,000 board feet of kiln dried lumber. By this time the fire was moving too fast and had no problem taking a dive in to the last remaining. Throughout the night other employees and personnel had made their way to stand by, watch and console in each other. I can’t even describe the amount of emotions and anxiety I experienced throughout the night. As the sun started to come up smoke continued to roll slightly off the remaining coals and ash with every now and then concrete exploding from the intense heat sending shrapnel, rubble and a cloud of dust into the air. We stood together and reflected back on the night glad the no one was hurt and laughed about the only identifiable thing remaining, the Pepsi machine alongside the building, that had power running to it nearly up to the end as the building flamed directly behind it. We separated to head home, get freshened up and meet back in a few hours to come up with a game plan. By 10:00 a.m. we had a temporary headquarters set up in an off site. Using the laptops that were fortunately off site, we logged into our off site server and began calling customers and vendors to inform them of what had happened. At this point we were even starting to reschedule orders with some products being able to be drop shipped directly to customers facility and rescheduled others not exactly sure what we were going to do yet at this point. Within 10 working days we were able to secure two new temporary locations, one in Tomah, WI to do our milling multi-production and another in Winona, MN to do our pre-finishing and hanging in. We had the best team of people anyone could ask for during this trying time. Everyone came together doing their part from updating our system inventory, orders, working with customers/vendors, purchasing new equipment, running across the countryside to pick things up and setting up our “new” temporary locations. Without this amazing dedicated group of people we would not have survived. It was an extremely tough and enduring feat but we have literally risen from the ashes and created a new and improved NCWP. We even lost a few truly great people from our team over the course of this rebuild and I want to wish the best in their current and future endeavors. Now at one year from an event that changed my life forever, we are all moved back into our home location but now with an additional new facility for pre-finish and hanging that doubles the amount of production area that we had before. I want to thank all of the people that helped both physically and also emotionally through their thoughts and prayers to enable us get to where we are today – Our staff, loyal customers and vendors, friends and family, and to all the contractors throughout our re-build process. We have overcame a tragedy resulting in a business that has been re-developed and designed to suit our customers better with more superior products in our manufacturing processes. Thank you for your past and continued future support!